What has happened to the mighty leader of the apes since we last saw him in Rise of the Planet of the Apes? 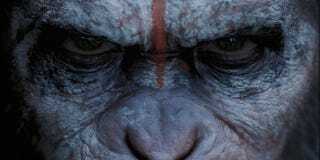 In our exclusive interview with Apes star Andy Serkis, the man behind the primate reveals all the details behind Caesar's new world order — plus more information on his next feature Jungle Book! io9: We saw the footage from Dawn of the Planet of the Apes and it blew us away. In it, the apes were using tools, and I saw one ape with a flower crown. It seems like Caesar's people are starting their own culture — but is it based on the trappings of humanity, or are you trying to build a separate ape culture? Andy Serkis: That's a good question. Obviously this is 10 years on [from Rise of the Planet of the Apes] and Caesar carries with him a desire to create a new society, an egalitarian society, which is to bring all of the Apes together, the Orangutans, the Chimpanzees and the Gorillas and so on. So what he had to do is find a commonality, a common language. Throughout the course of the movie you will see them communicate. They communicate using sign language, because obviously he has an enhanced intelligence from the drug that he inherited. He starts to use human language because he was brought up with human beings. He's carried with him certain tenets of belief that meant something to him from his relationship with human beings. So he's not completely excluded the best of humanity, I like to think. With that is a sense of egalitarianism, and being a natural leader without having to rule with an iron fist. Being empathetic. Caesar is a very empathic character and tries to see everyone's point of view. He is very pro-Ape, at the beginning of the movie, and for the first part of the movie really we think that humans have of disappeared. The sightings have become less and less over the last 10 years, since the end of the last movie. They [the Apes] are living up in Muir Woods and the lights in San Francisco are sort of dimming and dimming, and eventually they disappear. So for all intents and purposes they think they are alone, and then suddenly into their lives come come humans, and it shakes him up. He is then drawn into a very difficult situation, where he's trying to manage what eventually could be a human invasion And a conflict between Apes and Humans. Of course, he is terrible torn because of that. But the person that you are referring to with the the flower crown is, in fact, Caesar's wife Cornelia, who is played by Judy Greer. What you were seeing is the celebration of the birth of their infant child. We start the movie with a real state of the nation, peaceful culture that's taken years to bring together. I know in Battle for the Planet of the Apes when Caesar starts a society where Apes and Human are living together, there are rules and there are laws, and when you break them there are consequences, and that's a huge part of that film. Are there rules and laws in the new Caesar's world that he's created? Will we see him enforce the rules? Serkis: Yes, there are very basic tenants of belief like, "Knowledge Is Power," and "Ape Shall Not Kill Ape." The question is, if we were starting a society from scratch, what would we carry with us? But he's an ape of his word, he does carry the law out, yeah. You mentioned Caesar's wife —what other characters are we going to see Caesar interact with? Will it be mostly apes? I saw the Orangutan Maurice in the footage, so we know he's back. There's a very strong relationship between Caesar and his teenage son, River. This film is very much about family, about how and to what lengths one goes to, to defend ones family without being destructive to others. So it is about tribalism, to a certain exten). His son really embodies the spirit of the new, about the possibility of a new future. And yet, an impetuous future. Caesar acts as a counter balance to his son's desire for change and his slightly (in his eyes) reckless "way forward." He's managing a teenage son, and you see that relationship evolve and change, it's a huge part of it. The other central relationship that he has is with one of the human beings played by Jason Clarke, Malcolm. When it transpires that there could potentially be a flare up between Apes and Humans, but they see in each other a potential for a peaceful solution. They literally seek each other out and try and find a way of stopping things from escalating into a larger conflict. Gary Oldman's antagonist also looks like he's lost family. Is Caesar going to see eye-to-eye with this other broken father? Gary Oldman's character, you really do feel an incredible amount sympathy for him, but he's also a pragmatist and a survivor. And he's very much of the opinion that Apes must be wiped out. And although you sympathize with that character and his tragic losses… it really examines with a big upheaval and a big regime change in both societies.What are the things you hold on to? How far are you prepared to go in the destruction of the other to keep your own tribe alive, and your own family safe? How much of the culture that Caesar has established become humanized? Since Caesar is around more Apes, you would assume he become more Ape-like, right? Actually, it's the opposite! Physically, he's more human like. I always believed that Caesar was almost a human in an ape's body. That was the way I approached him from the word "go." He was the opposite all the time. He's an outsider, he's outside his own skin. Although he's created this society of apes he's probably the most human-like one there. As we discussed earlier, he has carried with him the best of humanity. You see that as really he starts to use human language more, and encourages the other apes to use human language more, as a way of understanding the other. There's no need to be exclusive in his eyes. So are other apes using human language? Are we going to see schools set up, where there's a teacher and whatnot? Yes. You do, very early on, you see Maurice acting as a school teacher and teaching the next generation. It's a real fertile ground for exploring. The second generation kids who learn quicker than their parents, and so on and so forth. We had a lot exploration of the combination — not jumping too far forward so they're all very eloquent and philosophical and articulate, but so they express themselves still through ape vocalizations, through the sign language that Caesar has taught them and Maurice has taught them, and some prototype human language. CinemaCon debuted a reel today that was Lord of the Rings all the way through to The Hobbit, and there's a shot of you in your white performance capture suit as a very early Gollum. In this movie, I remember seeing the reel that Fox showed of you acting in the monkey habitat where you could see your facial expressions clearly being translated onto the face of Caesar. I'm wondering if you could give us an idea of how far we've come with performance capture from then to now? We started Lord of the Rings in 1999, so it's been a long time now. I've been lucky enough to sort of be on this trajectory which has taken me into performance capture in a major way. And I've grabbed it with both hands, because I believe it's an amazing tool, and it is a portal into playing all manner of characters. Which I have done. The technology has evolved in the sense that it's become more transparent. You don't really realize that it's there at all anymore. And even more importantly, the perception has changed — the use of the authored performance is much more respected. The technology is one thing, but basically one has to remember that it is only technology. Performance capture is another bunch of cameras. It's 360 degree cameras filming an actor, and I think it's the understanding of that has changed, and that's happened because we've gone from a single character like Gollum to multiple characters in films like Avatar. It suddenly went from being an outside, peripheral activity and a singular activity to virtual production. Avatar was a groundbreaking movie. And [in terms of] performance capture live on set, Rise of the Planet of the Apes was a game changer there because it enabled you to be actually out on location shooting the movie. And then this movie, Dawn of the Planet of the Apes, is the biggest ever. In Rise we were shooting on sets for the first time. And with this, it's the biggest on-location shoot with performance capture and multiple characters. There's been a significant change. But also the way that Weta digital, whom I've worked with on oct of those projects, that they have now schooled their animators to honor the performances that are given by the actors on set. And the teams of people who understand that way of working now are established. And that's something that has really changed. It's a given that they absolutely copy [the performance] to the letter, to the point in effect what they are doing is painting digital makeup onto actors' performances. It's that understanding which has changed as much as anything. How much of Jungle Book will be performance capture? Everything. It will be an entirely performance capture movie. Wow! Talking animals — the whole she-bang?